The Swiss market for solar thermal systems is decreasing since 2009 where it peaked to 160,000 m2 newly installed. In 2015, about 100,000 m2 were installed. The main reason is the ongoing growing PV market thanks to the feed-in tariff, but as well due to relatively expensive system cost. Evacuated collectors keep their small market share, the area of newly installed flat plate collectors decreased from 2014 to 2015 by more than 20%. Unglazed collector installation increased, but depend on few bigger projects, especially in combination with charging an ice storage. Also, heat pump solutions take over solar thermal market shares. For 2017, market figures are not yet published. Swissolar expects a further decrease in annual installation to about 50‘000 m2 which corresponds to a 15% decrease compared to 2016. Today, about half of the collector market is forced circulation DHW systems with ususally 50 litre storage volume per m2 collector area and a collector area of 4 to 6 m2. In terms of systems installed, they represent more than 80% of the market. Less than 20% are combisystems, and their market share is decreasing with increasing numbers of heat pump solutions. Single family homes are still dominant representing about 80% of the installations (DHW mainly and less combisystems than in previous years). Besides external factors (CO2 tax with a very limited impact and fluctuating oil price), the Swiss solar thermal market is predominantly driven by the good will of private persons and the trust they put into this solution to help the planet and their wallet. This is why the market is primarily on single family houses and to a smaller extent also on pre-heating of DHW in dwellings. In addition, the Swiss cantons are starting to establish cantonal building regulations requiring the use of renewable energy in new buildings or in the case of renovating the heating system. However, with the latest changes an even stronger trend to heat pump solutions and PV can be expected. For the further deployment of solar thermal, the realization of new regulations in the cantons will be decisive since the consideration of solar thermal for DHW in case of renovation will be stimulated. 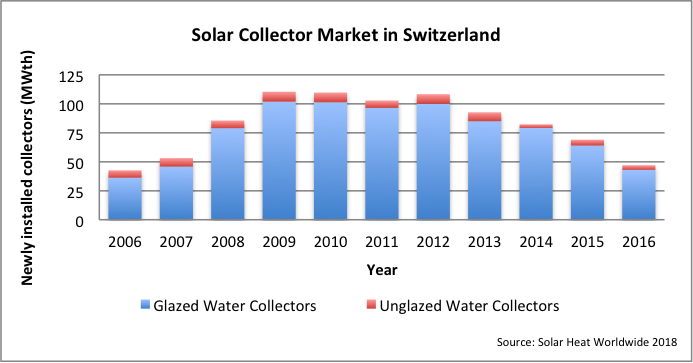 The Swiss solar thermal industry is relatively small. About half of the collectors installed in Switzerland are imported, mainly from European countries. The other half originates from domestic production. From the total Swiss collector pruduction, about one quarter is exported. Most products are sold via manufacturers to installers. There is no real dominant manufacturer on the market, three are in equal top position and since years their relative market shares appear stable. The Swiss solar professional association Swissolar estimates that there are about 2'000 jobs from the solar thermal market slowly shifting towards the solar PV market as well as towards the heat pump market or wood boilers suppliers. As in the whole building sector, Swiss solar thermal systems are expensive compared to other countries. A DHW system covering about 60% of the needs by solar costs around 9,000 to 12,000 Euros for 6 m2 and 500 l storage installed (without subsidies). These cost are manily driven by installation costs (typically one third). A solar thermal system for domestic hot water supply in MFH with about 12 m2 collector area and 1'000 litre storage volume would currently cost about 1'900 Euro per m2 collector area installed. Reducing the total cost is a challenge that we currently work on together with the solar manufacturers in the frame of SHC Task 54. Some country specific regulations contribute to high costs of installation, e.g. the obligation to use scaffolds or comparable safety barriers when working on a roof. Swiss installations tend to be of high standard corresponding to the demand of the market and better quality comes often at a price. One example : The use of (more expensive) stainless steel storages for domestic hot water installations is common instead of emailled steel storages. Quality controls are to be deployed with low cost monitoring devices coming from pilot projects that showed their benefits. The brand MINERGIE® is a sustainability standard for new and refurbished buildings. It is mutually supported by the Swiss Confederation, the Swiss Cantons along with trade and Industry and is registered in Switzerland and around the world. Comfort is at the heart of MINERGIE® – the comfort of the users living or working in the building. A wholesome level of comfort is made possible by high-grade building envelopes and the continuous renewal of air. Specific energy consumption is used as the main indicator to quantify the required building quality. In this way, a reliable assessment can be assured. Only the final energy consumed is relevant. The MINERGIE® Standard is widely accepted. There are many reasons for this, the most important being the objective oriented approach: If builders and planners – in other words architects and engineers - can achieve the standard, they have complete freedom both in their design and choice of materials and also in their choice of internal and external building structures. In the meantime, the building sector has developed a wide range of products and services for MINERGIE® buildings. Suppliers include architects and engineers as well as manufacturers of materials, components and systems. The diversity and competition of this market increases quality and lowers costs. The last product is a zero energy building standard, called MINERGIE-A. MINERGIE-ECO that includes to adress indoor environment quality is having a small market share in the MINERGIE market. Since MINERGIE is a label for a project, quality controls of built MINERGIE projects must be undertaken. For this reason MINERGIE started a supplementary product for quality assurance. This reaches out beyond the planning phase, to the construction and the operation phase of a building. Very typical heating technologies are heat pumps, especially for new buildings, sometimes in combination with PV. New legislation supports this trend, and it goes along with the MINERGIE® standard. Solar thermal combisystems never had a big market share which tends to further decrease. Seasonal storage in water tanks is a proven solution in several pilot projects and a few houses or buildings choose it. An emerging combination that has been demonstrated in several pilot and demonstration projects is heat pump and ice storage recharged by solar absorbers. Examples are a 75 m3 ice storage in a MFH in Rapperswil close to Zurich and the project « La Cigale » in Geneva which provides monitoring data in the internet that reveal promising results (see http://renov-lacigale.ch/en/). Another emerging technology is PVT which has also been demonstrated in several system concepts in the past years. Cantonal support schemes for MINERGIE buildings or the national programme for building renovations (see www.dasgebaeudeprogramm.ch) are key drivers for the interest in energy efficient buildings. CO2 taxes have been increased to 84 CHF/t since national objectives were not met. But this has little effect on consumer choices since oil prices have decreased in greater proportions. Legislation makes solar DHW mandatory in very few cantons. Some subsidy schemes on low level exist in some cantons for solar collectors (per m2). See statistics on www.swissolar.ch/ueber-solarenergie/fakten-und-zahlen/ (available in German, Frech or Italian). From a solar heating and cooling point of view, a « typical » solar building in Switzerland would be a building equipped with a solar thermal system that provides DHW. Thus, such a « typical » solar building does not have significant additional costs. As a Swiss contribution to SHC Task 52 a tool is under development that should give an indication of the benefits and costs of including solar thermal in energy supply concepts of living space (SFH, MFH, areal or heating net level), based on studies and literature available from several countries and installations. According to a recent study, the preheating of DHW by solar thermal for MFH leads to heat costs (whole system) of about 0.19 CHF per kWh in a typical case which is in the range (even slighty lower) that e.g. the total heat costs of a heat pump plus PV combination proposed as a standard setup in the MuKEn 2014 (regulations related to energy in buildings developed and agreed by the Swiss cantons). The integration of both solar thermal and PV on the same roof with the same frame and shape is a topic under devlopment as well as approaches to use the facade. PVT collectors and colored collectors have been further developed in the past years. Colored thermal collectors are expected to be on the market like the colored PV modules that have been demonstrated on some buildings in Switzerland and Denmark, using the technology developed in Switzerland since 2001. One of the current core areas of research is the cost reduction, e.g. by drain back concepts with temperature limitation. In close cooperation with the most important funding agencies that competitively award grants, the Swiss Federal Office of Energy (SFOE) supports and coordinates research and innovation in the energy sector along a major part of the innovation chain. Swiss national R&D programmes exist for solar heat and heat storage, for solar industrial heat, and for energy in buildings. The activities of SFOE are based on a programmatic and subsidiary approach that is governed by the Federal Energy Research Masterplan. The research programmes are accessible to any organisation in Switzerland presenting a project that will be evaluated by the Swiss federal office of energy. Beside R&D projects, also pilot or demonstration projects can be applied for. Ice Storage: Several development and demonstration projects. The updated Polysun software incorporates solar and heat pumps solutions coupled to IEA SHC Task 44 work and can run online www.velasolaris.com/vs2/, Other SHC Tasks are being followed carefully by Vela Solaris in order to incorporate in Polysun the latest from international research. Colored glasses which are still transparent to solar radiation have recently been introduced on the market by the new Swissinso start-up company. They produce colored solar glass using a technology developed by the LESO at the Swiss federal institute of technology of Lausanne. www.swissinso.com. Several big buildings have been equipped with this Kromatix technology in the world (Copenhagen, Dubai, Lausanne) and the market is due to increase mainly in the PV sector. Thermochromic layers are in the R&D pipeline at EPF Lausanne. We expect a commercial layer in 3 to 5 years. The legal basis for the support of R&D and market dissemination measures for energy efficiency and renewable energy is the national law of energy. The CO2 reduction goals of Switzerland have been publicehd (50% reduction in 2030 from 1990 levels). A Strategy 2050 for more renewables in CH in 2050 has been decided in parliament in 2016 and accepted by a public voting in May 2017. In Switzerland, the government is responsible for the funding of R&D, whereas the cantons are responsible for building regulations and subsidies for renewable energy installations. Not all cantons are equal in their solar support. A pilot project to detect solar installations failure or misactivity is about to deliver a low cost monitorong for tracking solutions together with a web site where every actor can follow a solar installation part of the monitoring programme (willing basis).